At Rajkot on Jan 1-5, 2017 – Tamil Nadu played Mumbai in a Ranji semi-finals and lost. The player of the match was debutant Prithvi Shaw who scored a century in 2nd innings. Today at the same Rajkot, against not-so mighty West Indies teen-age sensation, Prithvi Shaw marked his Test debut with a commanding 99-ball hundred - the third fastest (in terms of balls) on debut. Shaw also became the youngest Indian - and fourth overall - to hit a century on debut. He smashed more records against a depleted West Indies attack at the SCA ground in Rajkot, where he had cracked a ton in his maiden first-class game in January 2017. Many know him as Indian U19 title winning Captain. India has participated in 10 U19 World Cups since 1998 and won the title four times and finished runners-up twice. In the inaugural U19 World Cup in Australia in 1998, Amit Pagnis was the captain of the team. In 2nd Mohammad Kaif led and won the maiden title. Yuvraj Singh was named as the player of the tournament. In 2002, it was Parthiv Patel; in 2004 it was dinesh Karthik. The left-handed middle-order batsman Ravikant Shukla led India to their second final of an U19 World Cup. In 2008, it was the mercurial Virat Kohli and in 2010 – left-arm spinner, Ashok Menaria. In the next two editions Unmukht Chand and Vijay Zol led India. 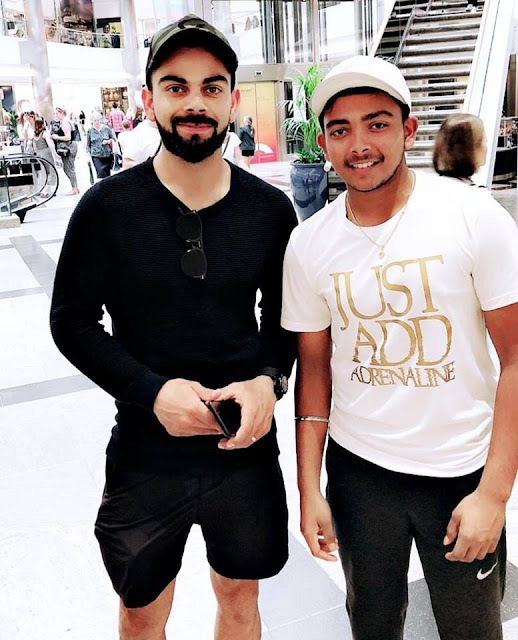 Under Ishan Kishan, the wicketkeeper from Jharkhand, India lost the finals to West Indies and Prithvi Shaw led India to another title triumph in Feb 2018 at Mount Maunganui. South Africa tweaker Imran Tahir spun a web around the Zimbabwean batting line-up as he scalped a sensational hat-trick during the second ODI between the two teams at the Mangaung Oval in Bloemfontein. Tahir scalped the wickets of Sean Williams on the last delivery of the 18th over and then removed Peter Moor and Brandon Mavuta on the first two deliveries of the 20th over to complete his hat-trick. Tahir became only the fourth South African cricketer to scalp an ODI hat-trick after of Charl Langeveldt, JP Duminy and Kagiso Rabada. Batsman M Vijay is the latest India player to speak about a lack of communication between the selectors and players who have been dropped from the squad. Vijay had made 20, 6, 0 and 0 in the first two Tests of India's five-match series in England. He was not picked in the XI for the third Test and was dropped from the squad for the last two matches. "Neither the chief selector nor any other person spoke to me in England after I was dropped from the third Test," Vijay told Mumbai Mirror. "None of them have spoken to me since. I did have a conversation with the members of the team management in England and that's it." None of that would make news ~ and the teen-age sensation Prithvi Shaw became the 293rd cricketer to play for India in Test matches. Prithvi Shaw (18 years 329 days) opened with KL Rahul and faced the first ball. The entire country knew he'd be making his debut in Rajkot on Thursday. They also knew he had taken the Under-19s to a World Cup title and scored a century on Ranji Trophy debut, right here at this SCA ground. The stage was set. The cameras were rolling. It would have been rude if the star didn't align. By the time the game was 33 overs old, Shaw had become the youngest Indian to score a Test hundred on debut and he reached for the skies in joyous celebration. 99 - Balls taken by Prithvi Shaw to score his century, which is the third-fastest by any batsman on Test debut. Shikhar Dhawan's 85-ball ton against Australia in Mohali in 2012-13 is the fastest century on debut. Dwayne Smith had reached hundred off 93 balls on his debut. 3 - Number of batsmen to score centuries on their Test debut at a younger age than Shaw. Mohammad Ashraful and Hamilton Masakadza had done it before turning 18, while Saleem Malik was six days younger than Shaw. Overall, Shaw is the 15th India player to get a ton on his Test debut. The only other ‘Shaw’ to play Test cricket was England’s Alfred Shaw, who had the distinction of delivering the first ever ball in Test cricket on March 15, 1877. Prithvi Shaw created a national record, hitting 546 playing for Rizvi Springfield against St Francis D’Assisi in an inter-school match for the prestigious Harris Shield. The youngster smashed 85 boundaries and five sixes and in the process, he became the first schoolboy cricketer to hit a 500 plus score in an official inter-school match. Leading India in U19 2018, he scored 261 runs in 6 matches, becoming the highest run-scorer among Indian captains in the tournament’s history. He surpassed Unmukht Chand’s tally of 246 runs in the 2012 edition of the tournament. Prithvi Shaw impressed with his performances in the 2018 Indian Premier League (IPL) as he finished the edition with 245 runs in 9 innings at a strike rate in excess of 150 for Delhi Daredevils. So now starts the endless comparisons for Prithvi Shaw !!! Away, the ICC panel hearing a dispute between the PCB and BCCI could potentially deliver a "landmark" judgment with reverberations for all intersections between sports and politics. A three-person dispute panel, set up to arbitrate the PCB's claims for monetary compensation for two bilateral tours the BCCI didn't honour, finished proceedings in Dubai on Wednesday. There is no indication when the panel, headed by Michael Beloff QC and including legal heavyweights Jan Paulsson and Dr Annabelle Bennett, will return a verdict though it is not unusual in such cases for it to take anywhere between four and six weeks. Lawyers from both sides presented their cases over three days that began in what was described as a "tense" and "formal" atmosphere and which remained "intense" throughout. A couple of officials likened it to the tension of an India-Pakistan limited-overs encounter. The dispute centers around an agreement the two boards signed in 2014 to play six series over eight years between 2015 and 2023. The PCB is claiming compensation of USD 63 million for two series it was supposed to host in November 2014 and December 2015 as per the agreement, but which eventually did not take place. Ties between the two countries have been strained since the 2008 Mumbai terror attacks and we firmly believe that there is no need for any sports relations too with the war-mongering neighbour. Talent of pruthavi Shaw should be natured properly under M S Dhoni. The international cricket becomes different ball game. It's more mental strength than technique.